Greater Lansing - It's Miller Time! Greater Lansing - It&apos;s Miller Time! I&apos;ve never been too into figure skating - I&apos;ll come out and say it. I really haven&apos;t. I mean, I grew up with 4 older sisters, so yes, it was on the TV, especially during Winter Olympic time, but I have never looked for it myself or ever made a point to watch it. Let&apos;s just say things are a little different now, let me tell you why. For my work with the GLSA I had to coordinate several different Greater Lansing sports to be shot by a professional video crew. (Check out the final product on the homepage of this website! Not bad, huh?) Well one of the stops we made for the video shoot was out to Suburban Ice. Greater Lansing is a great ice sports community so we wanted to be sure to showcase all the great ice in our community available for athletic events. I met with Suburban Ice coaches and staff to set up the shoot and to see if we could get a local figure skater to help us out with some shots. They told us Hannah Miller would be practicing at the time we&apos;d be out there. We said that sounded good. We had no idea what we were in for. We get out tothe rinkand the video crew is getting the camera and lighting ready and out comes Hannah Miller - this tiny little thing skating across the ice toward us. She says with a smile, "What do you need me to do?" We didn&apos;t really know, we just wanted to get some footage of a skater doing her thing. Her coach told her to do part of her program and we set the tape rolling. I&apos;m telling you, she was amazing. Literally blew our minds. She did all these incredibly difficult jumps and spins as easily as if she was turning on a light switch. She made no mistakes at all! In fact, she was so flawless we only needed to shoot her for about 5 minutes because everything she did was perfect.Literally everything was aperfect shot. I was amazed. I shouldn&apos;t have been. Greater Lansing&apos;s own Hannah Miller is the 2011 U.S. Figure Skating Ladies Novice National Champion. That means she&apos;s incredibly good, even in the eyes of experts. In case you&apos;re wondering, Yes, she&apos;s one of THOSE Millers. By that I mean she comes from the greatlocal family, Miller, who have sent so many talented Hockey players through Michigan State and on to the NHL. So yes, she has the blood-line, but she&apos;s not riding on anybody&apos;s coat tails - this girl works! she is practicing figure skating before and after school everyday and then even longer on weekends. Coming up this Sunday, January 15th at 3 p.m. at Hannah&apos;s home away from home (Suburban Ice East Lansing) she will be putting on an exhibition, free to the public as part of her big send-off as she gets ready to head to San Jose, California to compete in the U.S. Figure Skating Championships. I&apos;ve already had the chance to see this incredibly taleted athlete up close, now its your turn. 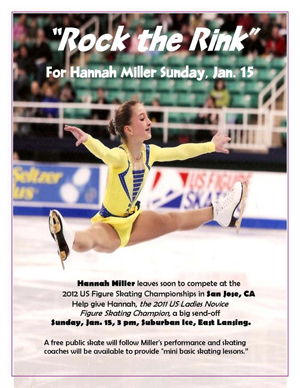 Get out to Suburban Ice this Sunday and when you watch Hannah Miller, find yourself becoming an instantsupporter of figure skating and this little dynamo&apos;s biggest fan, as she takes on the figure skating world. Hannah&apos;s exhibition will be followed by a free skate and some mini-lessons for anyone who thinks they might like to get into figure skating. Get out and support this great local talent - It&apos;s Miller Time!